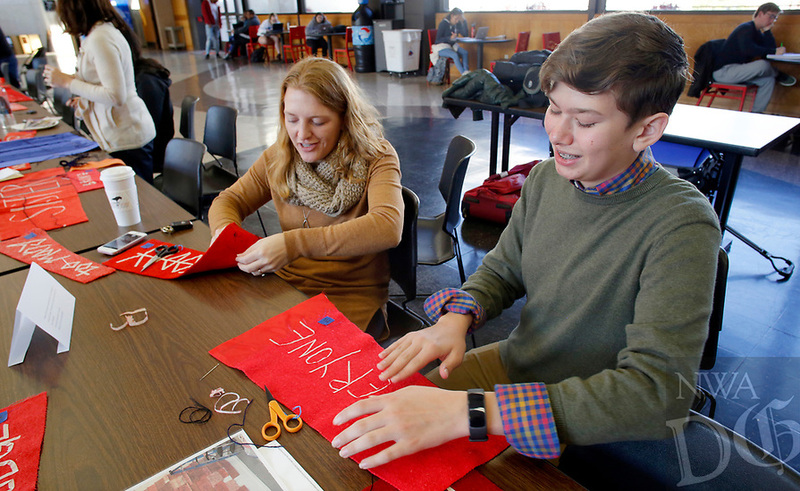 NWA Democrat-Gazette/DAVID GOTTSCHALK Cooper Tidwell (right), and eighth grade student at Farmington Junior High, sews Wednesday, November 7, 2018, with Donna Jones, director of recruitment and outreach at The School of Art at the University of Arkansas, in a sewing circle hosted by artist Marie Watt in the Arkansas Union on the campus in Fayetteville. Watt, who is featured in the Crystal Bridges’ exhibition Art for a New Understanding: Native Voices, 1950s to Now, was working on a collaborative assemblage of sewing panels featuring lyrics from the Marvin Gaye song What’s Going On released in 1971. Tidwell was participating in a career exploration program that had him shadow Jones.